January | 2012 | E-verything! 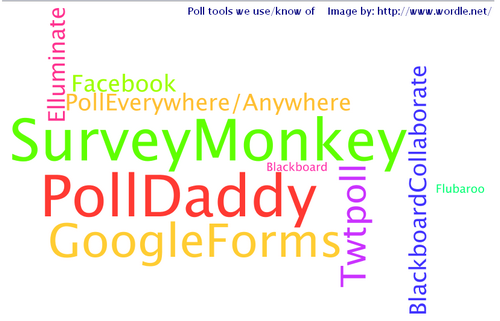 Edublogs webinar overview – What poll was that? In this recorded session we took a look at if, and how, we use/have used e-polling or surveys. The idea for this session was triggered when I used a poll in the overview for last week’s Serendipity and wondered about the different polling and survey tools that people use. We started with a look at whether we had used polling/surveys either as a respondent or as an information gatherer. Then moved on to the platforms on which we have used them, finding that most of us had used polling/surveys on one or more of: Twitter, Facebook, blogs, mobile devices and of course “Other” including Learning Management Systems, Elluminate/BlackboardCollaborate and email! Then came the most interesting part of the session where we started to look at tools we have used and/or that we know about. We began this by using a whiteboard to name those tools we have used as information gatherer, and as respondent and also those we have heard about. Next came the best bit where members of the group shared an experience of using a poll/survey tool, We had brief looks at GoogleForms (including a quick play), Facebook, Flubaroo and PollDaddy before running out of time and moving on to our best takeaways from the session. This session flew by and we reached the end far too soon! This was so interesting – I love to know what tools others are using and to hear about the contexts and purposes. I had a major takeaway in that although I was aware of GoogleForms in a vague way and had responded to polls via that tool I didn’t realise how many different question types there were. Neither had I really taken in the fact that a spreadsheet is automatically created for the answers thus making subsequent data analysis very easy. Our next session will be an Edublogs “Serendipity” session on Thursday January 19that 23:00 GMT/UTC (Afternoon/Evening USA) or Friday January 20th at 7am West Aus, mid morning Eastern States Aus depending on your timezone (check yours here) – in the usual BlackboardCollaborate room. This is one of our fortnightly unconference sessions where we invite you to bring along your “hot topics” and “burning issues” for our poll on the topic. Our first Serendipity session of the year was a great session! As always the session was recorded and is well worth a watch/listen for the huge amount of sharing of ideas and links. I’m sorry for the delay in posting – a combination of migraines, a visitor staying and too many things still to do before I go back to work has left me without enough time! We started as usual by putting our topic ideas on the whiteboard and then polling to choose the topic for consideration. The winner was a double topic “IEP for gifted students” and “Behaviour strategies for gifted”. Once the topic was chosen we started with a whiteboard for the headings and to collect some of our ideas and thoughts on this including some links. As usual ideas were also shared via text chat and audio. This was a lively session with much of the sharing via audio leaving me with a dilemma about an image/interactive for this week’s post. The whiteboard has only a very small part of those things that were shared as does text chat. So what I have finally done is to experiment with a survey! I enjoyed this session – this is one of the topics that we have visited before from different angles and I am always fascinated by the different directions taken when topics are re-visited. Because we never have exactly the same group of people each week Serendipity sessions are truly serendipitous in that our direction is informed by the particular experiences of out participants each week. Love it! Our next Webinar is our first Edublogs “Fine Focus” session for 2012, where we invite you to share your favourite online survey tools in “What survey was that!” join us on Thursday January 12th at 23:00 GMT/UTC the time for you will vary depending on your timezone (check yours here) Thursday afternoon/evening in the USA, late night Thursday in Europe, and Friday morning January 13th in Australia – in the usual Blackboard Collaborate virtual room. Ducks (and drakes) in my garden! Warning – this is not an e-learning related post :). As some of you know I sometimes digress into posts about the wonderful part of the world where I live and some of the activities on our block. This is one such post. However it was triggered by a tweet to me from a long time Twitter buddy @plangardengal in California who was one of my earliest contacts on Twitter around three years ago. We have talked gardens, food, animals, and education on Twitter so she knows we have ducks and was looking to talk about some “whys and wherefores”. Most of this post was the email I sent to @plangardengal – it was really just meant to say “ask away if I can help I will” but as always my fingers ran away on the keyboard and I found myself telling the tale of our ducks. Again a warning – this is not for the really faint-hearted we do have and breed both “chooks” (chickens) and ducks because we like the meat as well as the eggs and because we like to eat birds that have had a happy life! We started with the “chooks” and a couple of years later added the first ducks to the “flock” again for eggs and also to eat. 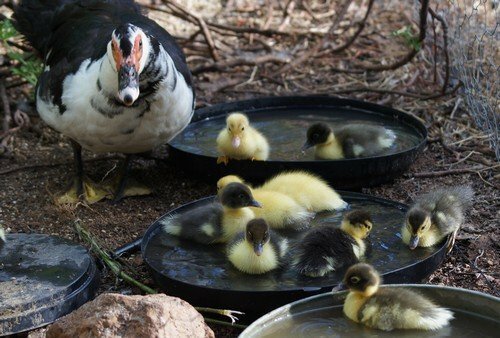 It seems that here ducks are better “natural breeders/incubators” than the chooks. 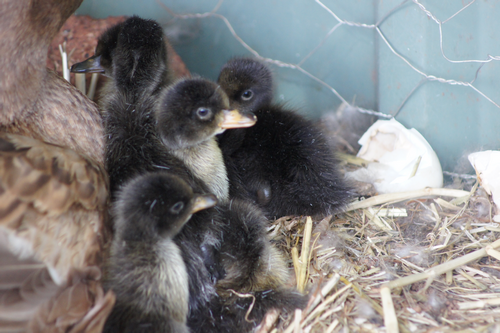 We use the incubator for chooks but ducks sit and manage their own incubation. We absolutely love our Muscovies! They are not only good layers, breeders and tasty eating but are also great characters. Their temperament is also excellent – calm (as birds go), very non-aggressive and totally relaxed in human company except when protecting eggs. Our first drake was a bit confrontational and bullied the chooks a bit so we swapped him for a better natured one though much older one. Some of our Muscovies are great escape artists – they fly over, climb over and wriggle under the internal dividing chook wire we have in the garden and to divide the chook pens up. So ideally they need fully enclosed runs or you need to fence the veg in as they love to eat emerging young veg! about 3 days ago & this year another 18 previously over 3 hatches). One of her offspring from earlier this year has also just hatched 4 ducklings (she was only sitting on 5 eggs so that is a good hatch too). 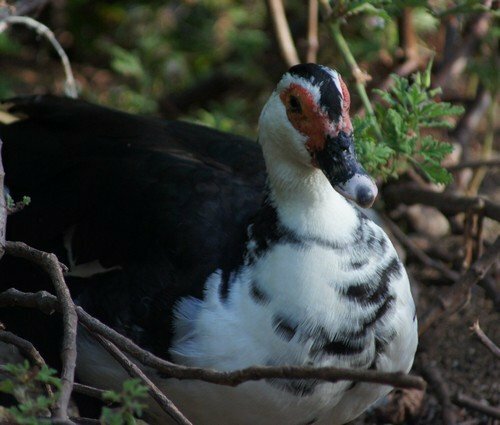 At the moment we have two drakes – both are Puddleduck’s offspring and both have now proven fertility with these two recent hatches. We plan to stay with two ducks and two drakes though we really only need one drake, having two reduces the risk of being left “drakeless” if (as happens with all poultry) one suddenly dies. We also now have Khaki Campbells. 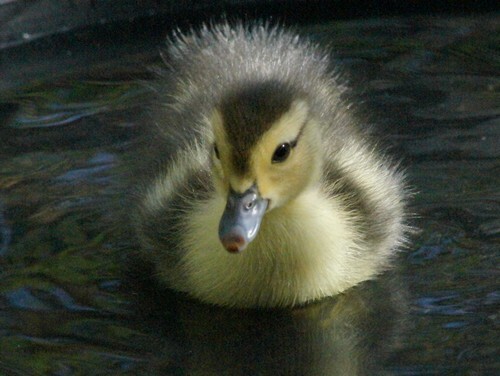 We were given 8 fledgling “drakes” one of whom was a duck – so kept her & one drake – they have already bred 8 ducklings. Their incubation is supposed to be 28 days, and as I write Mrs Campbell has just hatched 3 more ducklings. This was a great surprise as we had not expected any success from this batch as we believed that the young from the previous hatch had been sleeping in the nest (before we took them away) and had probably started the eggs into growth prematurely before the duck started to sit. The Campbells are very different characters from the Muscovies – again great eating and good layers but the two we are breeding from are very nervous in temperament. The group of 8 were all like that – stayed together in a tight bunch all the time, rushed around making lots of noise and kept as far away as possible from humans. These two have calmed a little but not much. We separated off the young (who were showing similar characteristics) when they were a few weeks old and put them in a pen with young chooks. This seems to have had a very good effect in that they no longer rush around in a bunch and they are much less scared of humans. All of our home-bred chooks rush around us and walk on our feet if we are anywhere near them and this influence is being passed on the the young ducks. The ducks and chooks are all wonderful characters and very entertaining to be around. I was picking figs this morning with several chooks hovering hopefully round my feet in case I should drop a fig when I heard flapping of wings from the other side of the tree. I went to look and found one of the chooks jumping (wing assisted 🙂 ) to peck at figs on the tree around a metre (just over 3 feet) from the ground! Now I understand why we don’t get many figs on the lower branches. These and similar antics by both ducks and chooks lighten our days and help us keep perspective in the stressful world of education.